We take coffee seriously. View our menu to find out about our handcrafted beverages, made to order artisan sandwiches, and freshly baked bakery items. Our Yama cold brew systems yield robust and sweeter coffee that is low in acidity with a smooth finish. Turkey, bacon, Gouda cheese, thinly sliced apples, and mayo pressed on focaccia. 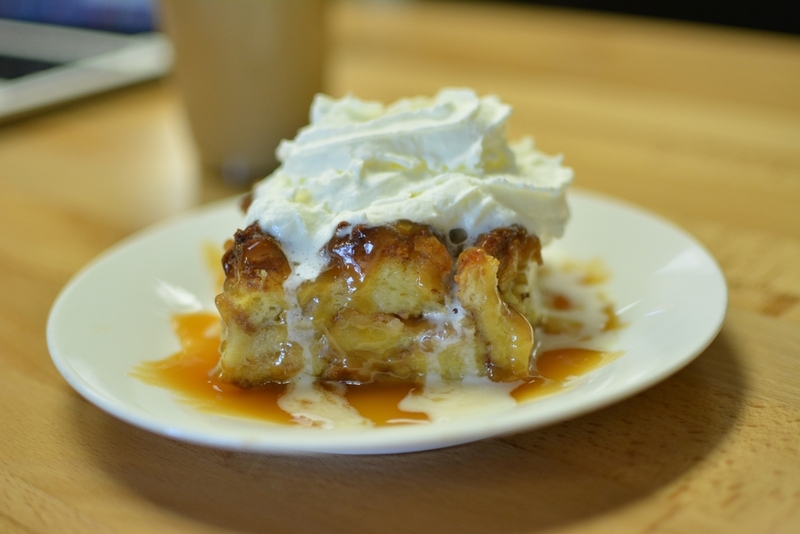 Bread pudding made from our fresh-baked cinnamon rolls. Amazingly good for breakfast! Ask about our daily coffee selection. Coffee of the day with steamed milk. Available in a single or double shot. Espresso with equal parts of steamed milk and foam. Espresso, steamed milk topped with foam. Espresso, steamed milk, cinnamon, sweetened condensed milk and whipped cream. Espresso, Ghirardelli chocolate syrup and steamed milk. Our cold brew systems yield robust, smooth, and tasty coffee that is low in acid and tastes sweeter compared with conventionally brewed iced coffees. Espresso and hot water iced. Espresso, Ghirardelli chocolate syrup and milk iced. Blended coffee beverage with flavor of choice. Variety of black, green and herbal teas. Option of regular black, sweet or green. Vanilla and rich in spices. Vanilla and rich in spices iced. Ghirardelli chocolate and whipped cream. Steamed cinnamon flavored apple juice topped with whipped cream and caramel. Cream, club soda and your choice of syrup. Must be 21 years or older to be served these beverages. *Served in 12oz bottles unless otherwise noted. Must be 21 years or older to be served these beverages. *Bottles are 750ml unless otherwise noted. A fruity white wine crafted from grapes grown in the Alpine foothills northwest of Venice, Italy. A light-bodied dry white wine crafted from grapes grown in the southwest region of France. A red wine from California that fills your palate with flavors of cherry, rhubarb, and red plum. A delectable and bubbly sparkling wine with a soft and fruity flavor made from the Glera grape which grows in the Veneto region of Italy. Zonin- Prosecco and orange juice. Muffins, Bagels and Cream Cheese, Cookies, Brownies, Fresh Baked Cinnamon Rolls, and More. Made with 2 eggs, veggies, and feta cheese. Made with two eggs, jalapeño, bacon, Cheddar, and creme cheese. Genoa hard salami and creme cheese on an everything bagel. Smoked Salmon with creme cheese, red onion, capers, and fresh ground black pepper on a toasted plain bagel. With brown sugar and a fruit/nut mix. All made to order sandwiches are served with chips and a pickle spear. Turkey, bacon, Gouda cheese, thinly sliced apples and mayo pressed on focaccia. Roast beef, red onion, Swiss cheese, and horseradish mayo pressed on focaccia. Roast beef, Swiss cheese, tomato, lettuce, red onion, and horseradish mayo on focaccia. Ham, swiss cheese, tomato, lettuce, red onion, and whole grain mustard spread on focaccia. Bacon, lettuce, tomato, and mayo toasted on a French bread roll. Cheddar, Monterrey Jack, and Gouda cheeses with mayo toasted on focaccia. Corned beef, sauerkraut, Swiss cheese, and our thousand island pressed on rye bread. Ham, Cheddar cheese and whole grain mustard pressed on focaccia. Cream and Cheddar cheeses, bacon, and jalapeños pressed on focaccia. Cheddar cheese, pickle slices, red onion, pressed on focaccia. Turkey, gouda cheese, pickle slices, lettuce, onion, tomato, mayo, salt and pepper served on focaccia. Please choose from our fresh soup options. Open Mic: Every 1st & 3rd Friday of the month! Trivia Night: Every 2nd and 4th Tuesday of the month! Casbah Coffee Company is a member of the SCAA.